It is possible that my favorite thing about The Current Group is that it is out of control. I don’t have the time today to get into everything that I think the The Current Group may be, but I think I can summarize some of my beliefs right now. The Current Group seems to be a group that performs and records music. I often like to think that I thought it up with N.N.N. Cook in Springfield, MO some time around 2003 so that he and I would have something to do when our (Y)Awn band mate Jonathan James was unavailable due to extensive touring with his other projects. Jonathan, NNNNNNNN, and I, along with many many other people – most notably Kyle Jeffries, and later Derrick Strain – facilitated (almost) weekly open improvised recording sessions in the Mayor’s basement. Now, if my timeline is accurate, nearly a decade has passed since the conception and I just saw that The Current Group has released a new album. I have not heard it and only stumbled upon this information by chance. Just to be clear, it is no surprise to me that a new Current Group CD was just released. As I understand it, there is still session work, live performing, mixing, and remixing actively occurring throughout the Midwest. In fact, I was just working on production for a Current Group track. What I am so surprised by and excited about is that the CD is not released by any of the people I named in my brief history and it is not available through our own close/far catalog. 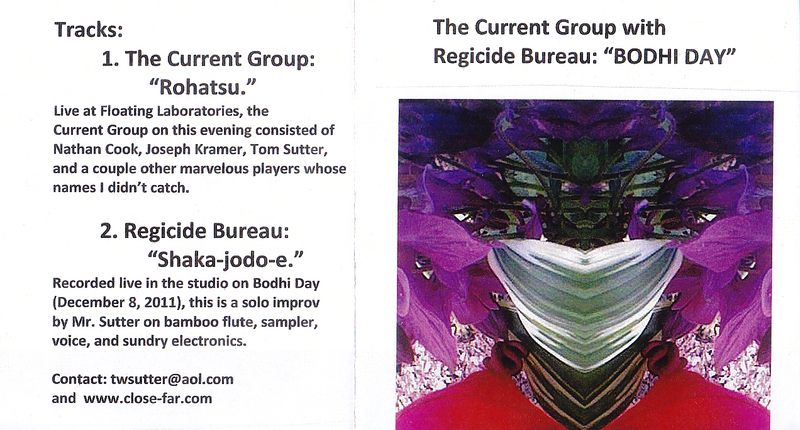 The new CD by The Current Group is called “The Current Group with Regicide Bureau” It has been released by Tom Sutter of Regicide Bureau on his own Hypermedia label. We have considered every person who has played in The Current Group to be a member of The Current Group. We have also felt that the music played by The Current Group belonged to The Current Group. But who/what is The Current Group? I believe that The Current Group is out of control. I don’t know who is running it, and that is awesome. Now I am not advocating that everyone release his or her own album by The Current Group – but Regicide Bureau is the ideal artist to release one without me knowing about it. Regicide Bureau is a member of The Current Group and performed on the recording. I know this to be a fact because I was there, I got a credit on the CD (Thanks!). There were some credits that were missed that I think I am qualified to fill in, too: Steven Kramer, Jenny Vallier, and Ryan Spilken were there too. They played metal objects, baby cello, and iPhone respectively. This album seems to take a position – and I think I am going to side with it. It seems to suggest that if you played the music, then you can let people hear it if you want to. Regicide Bureau, you see, trades and gifts these CDs through Recide Bureau’s Hypermedia label and a CD drop at Apop in St. Louis, MO. No sales, no money, no control, no problem. I can’t wait to hear it, now I just have to figure out how to get a copy! Good luck finding your own.